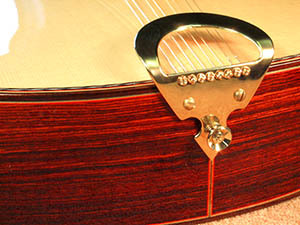 The octave mandolin is a tear-drop shaped instrument strung with four courses of steel strings, usually tuned GDAE or similar, one octave below mandolin pitch. Ten string and twelve string versions are known as citterns. These can be tuned in a variety of open or nearly open tunings. For many years octave mandolins and citterns were seen as being suited only to Celtic music , but they are now played in many forms of acoustic music. 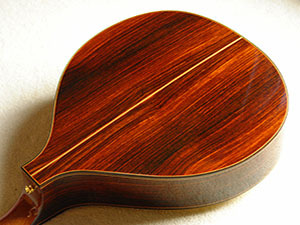 Most of the octave mandolins and citterns I build now are my large bodied instrument, as pictured. 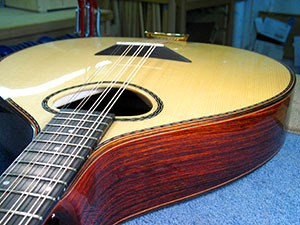 I also build smaller bodied octave mandolins and citterns; these share body dimensions with my mandola. 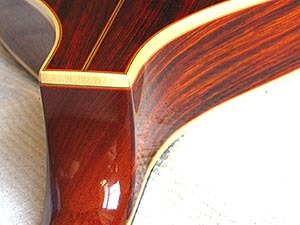 How I almost accidentally came to build my first octave mandolin is described here. 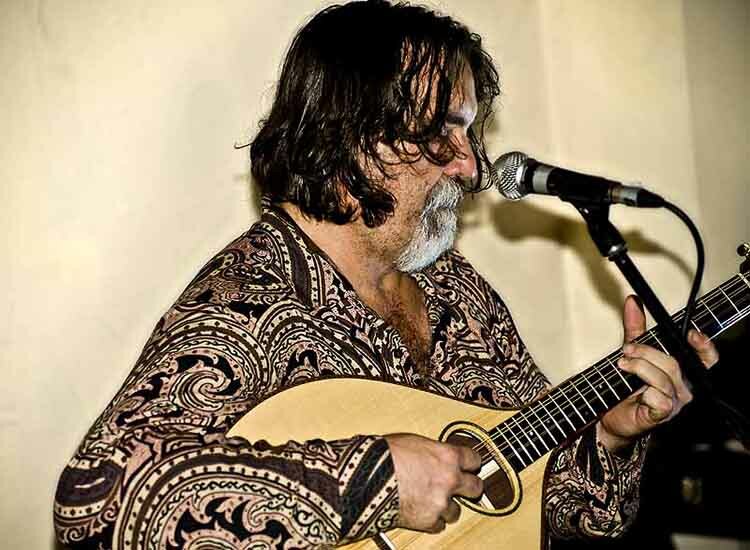 At the time Irish musicians were beginning to play Greek bouzoukis, and UK luthier Peter Abnett had built Donal Lunny a semi-round back bouzouki. But the octave mandolins with their resonant sound and shorter scale were different. They appealed to accompanists looking for an alternative to the acoustic guitar sound and to tenor banjo players looking for a softer and more sustaining alternative to the banjo clackety clack. 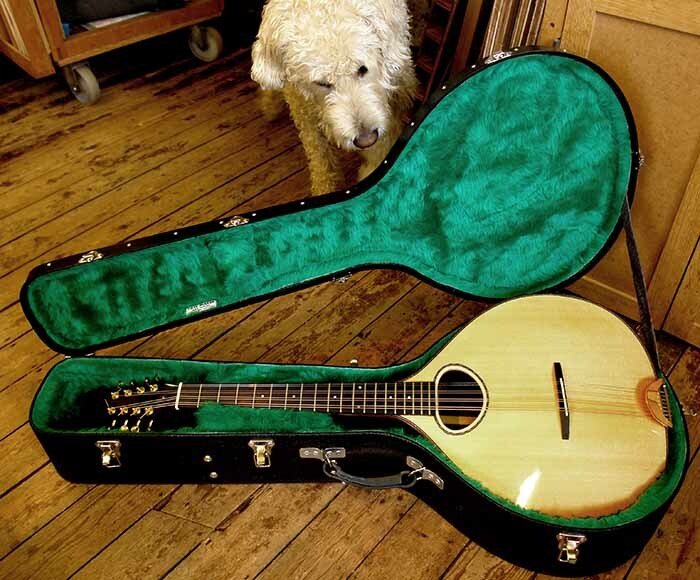 I built my first ten string cittern for Tom Gilfellon (of the High Level Ranters) despite considerable misgivings, but it worked well and was taken up by Brian McNeil of the Battle field Band and many more Glasgow musicians. It was these musicians who travelled with their citterns and introduced them to audiences all over the world. Darrell Scott playing his octave mandolin at the Blackfriars, Glasgow. Darrell plays this instrument, along with his MS model guitar, in Robert Plant’s Band of Joy. Amplification is by Highlander bridge pickup. 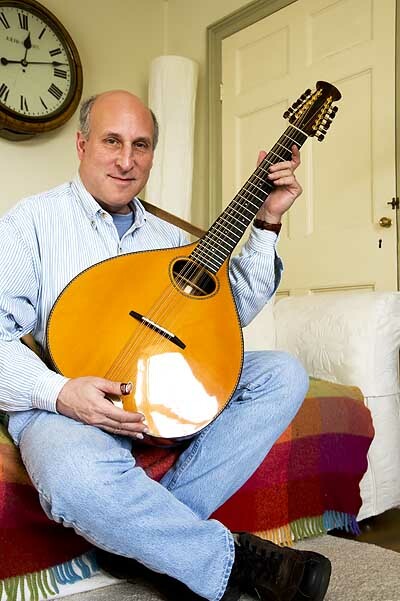 The ten string cittern is basically a five course octave mandolin. Many tunings are commonly used; some are mandolin type tuning with a low D, others open or almost open tunings. I can build 12 string citterns, like Joseph Sobol’s (left) to special order. All citterns, 8, 10 and 12 string instruments can have the longer bouzouki scale, which helps lower tunings such as low D or C.